River rafting has taken the world by storm. 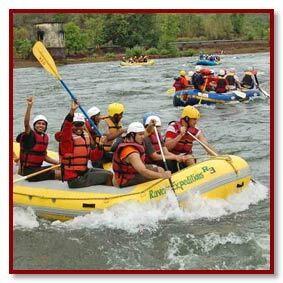 Often termed as white water rafting, river rafting is filled with thrills, enthusiasm and exhilaration. It is an above-the-world feeling as one meanders on the foamy, swirling and thunderous waters. It has an uplifting and a bedazzling effect on the mind. River rafting is a challenge to the spirit and stamina of the rafters. India offers a plethora of rafting locales. » Ladakh - Ladakh in Jammu and Kashmir is a popular rafting destination. The ideal stretch on the Indus for white water rafting is between Spituk and Saspul. Rafting becomes tougher as one moves beyond Saspol. It takes experienced participants to move ahead. » The Zanskar River - The Zanskar river can give you tough times as between Padum and Nimo regions it has a splendid course. The stretch is suitable only for a well-ordered expedition. The river running can take several days. » The Ganges - The Ganges near Rishikesh in Uttaranchal is no new spot for white water rafting. The river has 12 major rapids between Kaudiyala and Rishikesh. These rapids extend over a length of 36 kilometres. Rafting near Rishikesh is truly adventurous. » Himachal Pradesh - Himachal Pradesh also provides ample opportunities for the river rafters. The rivers Chandrabhaga in Lahul, the Satluj near Shimla, the Ravi near Chamba and the Beas near Kullu offer excellent options for white-water rafting. The 20-km long stretch between Shamsi and Aut on the Beas is a fantastic spot for adventure seekers. » The Teesta River - Moving towards the eastern Himalayan region you come across river Teesta in Sikkim. River Teesta too has a number white water rapids with various intensities. It's total fun and delight as one moves down the river relishing the picturesque beauty of the place. » The Brahmaputra - The Brahmaputra, as it crosses Tibet and enters the north-eastern state of Arunachal Pradesh, is a popular rafting destination for the adventure lovers. » The Kali Ganga (Sharda) - The Kaliganga or the Sharda enters India from the neighbouring country of Nepal. The Kali Ganga rushes down from the foothills of the Kumaon region and meets the Gori river at Jauljibi which is where the adventurous run starts. The stretch extends to a good length giving the rafters a pleasing experience. Do take with you the bee-sting kit, disposable camera, swim suit, nylon shorts, tennis shoes, wind-proof jacket, towels, a flashlight, a light sweater, sandals and a hat and you have been prescribed with medications like inhalers and insulin, never forget to take them along. Don't wear cotton clothes except during the summers as cotton takes away the warmth of the body. Polyester fleece or synthetic fabric will do the job, keeping you warm and drying faster than the cotton clothes. And never ever forget to dress in layers. It should also be noted that river rafting in some areas may require special permits from the Government. Areas close to the Indian International borders like Sikkim, Spiti, Lahaul and Nubra may not be accessible to foreigners without a valid permit. August to September is the best time for amateurs. The experienced and the skilled can go for rafting earlier in summer. Winters are not safe for rafting in the Himalayan rivers, as during the season one runs the risk of getting soaked which may lead to Hypothermia. The rivers, during the winters, are too cold to be tried. Teesta is the single river that allows rafting in the winter months between October and April. Copyright © PREMIUM TOURS INDIA All Rights Reserved.